Nevada County authorities arrested three people after finding what they call a honey oil lab on Victoria Drive. 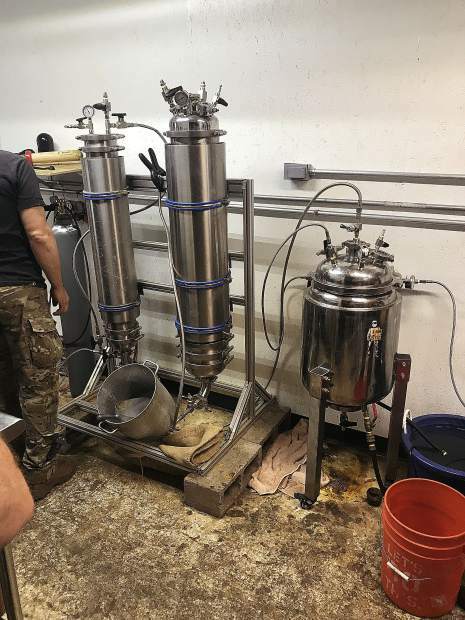 The largest honey oil lab ever seen by Nevada County authorities was sitting in plain sight on Victoria Drive, Sheriff Keith Royal said. Deputies responded around 2 p.m. Wednesday to the home after someone made a marijuana nuisance complaint. The home had no gate, and the officers approached the home, Royal said. Bryan Scott Compton, 31, and Jaclyn Christina Volek, 27, both of Grass Valley, were at the home and arrested immediately. Michael Patrick Dunn, 29, of Grass Valley, was arrested when he arrived at the home in the 19000 block of Victoria Drive, Royal said. All three face charges of manufacturing a controlled substance and criminal conspiracy. Compton and Volek each face an additional charge of possession of marijuana for sale, reports state. The honey oil lab in the garage enabled deputies to obtain a search warrant for the house. Inside they found a lab that filled almost the whole of the 4,000-square-foot structure, the sheriff said. “We’d never seen anything like it,” Royal said. Additionally, officers found 50 pounds of suspected processed honey oil and over $40,000 in cash, he added. Local authorities requested the Butte County Hazmat team for assistance. It helped safely disassemble the lab, Royal said.